EDUCATION TOURISM , FAMILY & CORPORATE PACKAGE TOURISM South indian Tour Packages, South Indian Backwater Tours, South Indian Hillstation Tour Packages, South indian Temple Tours, South Indian Beach Tour, South Indian Wildlife Tours, Houseboat Tours in Kerala, Honeymoon Tours in South India, LTC Tour Packages, Weekend Tours in South India, Cruises, Green Kerala Tours, Hillstation Tours and much more…Call +91-7604837477. God Bless everyone who travel with us and the visitors of this website. 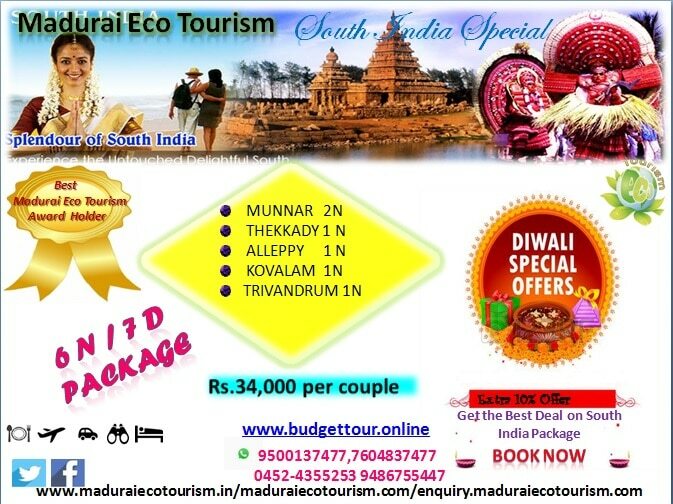 www.maduraiecotourism.com Tour Itinerary: Day 01 : TRIVANDRUM – KANYAKUMARI (110 Kms – 02 ½ Hrs) Warm welcome to the “Gods Own Country”. On arrival our representative will greet from the TRIVANDRUM Airport/Railway Station. Directly transfer to the important pilgrim centre of India, the KANYAKUMARI. Check-in to the hotel on arrival. Relax for a while and proceed for the KANYAKUMARI sight seeing includes the famous VIVEKANANDA Rock, MAHATMA GANDHI Memorial Resembling centre and the ThIRUVALLUVAR Statue. In the evening you can watch the beautiful sunset of the KANYAKUMARI. Overnight stay at hotel/resort in KANYAKUMARI. Day 02 : KANYAKUMARI – KOVALAM (100 Kms – 02 ½ Hrs) After breakfast check-out from the hotel and proceeds to the “Paradise of the South” the KOVALAM. Reach and check-in to the hotel on arrival. The day is free for you to enjoy in the KOVALAM beach. Overnight stay at hotel/resort in KOVALAM. Day 03 : KOVALAM – TRIVANDRUM – KOVALAM After the breakfast proceeds the tour to TRIVANDRUM. Trivandrum sight seeing includes the Sri Padmanabhaswamy Temple, Kuthiramalika Palace Museum, Veli Tourist Village, Trivandrum Zoo and the Shangumugham Beach. Later proceed back to KOVALAM. Overnight stay at hotel/resort in KOVALAM. Day 04 : KOVALAM – ALLEPPEY HOUSEBOAT (176 Kms. 05 Hrs.) After breakfast check-out from the hotel and proceed to the ALLEPPEY boat jetty and check-in to the HOUSEBOAT. The rest of the day is in the Houseboat. Overnight stay at houseboat in ALLEPPEY. Day 05 : HOUSEBOAT – COCHIN (158 Kms – 04 Hrs) After breakfast, pack your baggage with a promise of coming back again to this sweet holiday package. Check-out from the houseboat and transfer to COCHIN Airport/Railway station on time to board your flight/train for your onward journey with a lot of sweet memories of your holidays.